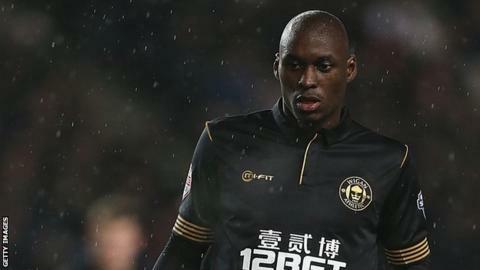 Wigan have been fined £40,000 for breaching the Football Assocation's Football Agents Regulations regarding the signing of Marc-Antoine Fortune. The charge related to agency activity carried out by Willie McKay for the Championship club in relation to the capture of the striker in July 2013. Both Wigan and McKay admitted breaking regulation C10(a)(i) at an Independent Regulatory Commission hearing. Fortune, 32, has played 48 times for the Latics, scoring five goals. McKay has been warned over his future conduct and had his overseas agent registration suspended for nine months. The suspension is suspended for two years. The sanctions are subject to appeal. Wigan, who secured a place in the Championship play-offs with a 1-0 win at Birmingham on Tuesday, said they were "awaiting the full findings of the Independent Regulatory Commission to enable us to review our position in respect of the decision".